The Eleaf iStick Pico Baby 25W Starter Kit presents an ultra-portable and stealthy compact vaping set-up with an impressive 1050mAh rechargeable battery to pair with the new GS Baby Sub-Ohm Tank. 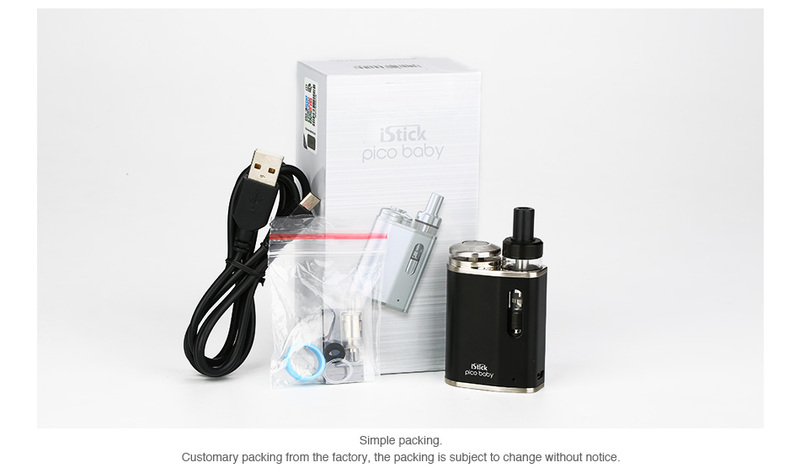 The iStick Pico Baby 25W Box Mod implements an extraordinary small built fully with ergonomic details such as recesses tank section and top-sided firing button. Powering the Pico Baby is the built-in 1050mAh internal battery, capable of firing up to 25W and a direct voltage based output system. Accompanying the Eleaf Pico Baby 25W Mod is the new GS Baby Tank with refined airflow system and the dependable GS Air coil structure. Your all in one box mod solution.